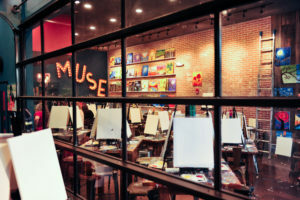 Paint and party at Muse Paintbar! Muse is the premiere paint and sip experience that combines painting instruction with a restaurant & bar, hosting painting sessions 7 days a week. All ages are welcome and no prior experience is required! Paint, party, and pour! Looking for a fun team building activity or a girls’ night out? Book a private party! Muse hosts private parties for any type of occasion – birthdays, bachelorette parties, work events, fundraisers, kids’ birthdays, you name it! For more details or to book a sessions, click here to view the Foundry Row calendar.